Lock in a great price for Quality Suites Oscar Freire – rated 8.4 by recent guests! Location is outstanding...close to excellent restaurants and shops and at the same time in a quiet, residencial section of the Jardins. The location is very good. Lots of restaurants and shops very close by. The staff was helpful and kind. The room and bed were good sized. They allowed an earlier check-in at no charge which was nice. Breakfast was good, large selection of food items. Nothing. The location is the inly readon I still stay at this poor hotel. Thank God there are others to choose from. I came back TIRED of a full day working - at 5:45 pm - wanting to take a shower and a nap before the event I did have to attend later that night , but my room was unmade. Nobody showed up to make up my room and change my towels. I had to call reception and get upset, and wait 20 minutes for the cleanup lady to show up. Then, I realised that the people from the fridge disnt replace my waters as well. I had to call reception but they got inside my room while I was taking a shower to do the replacements. Totally unprofessional. We did like the location and the very friendly staff, and the good breakfast. The restaurant is strongly recommende, excellent food! staff service is good, and the location is quite good. Quality Suites Oscar Freire This rating is a reflection of how the property compares to the industry standard when it comes to price, facilities and services available. It's based on a self-evaluation by the property. Use this rating to help choose your stay! One of our top picks in São Paulo.Located in the heart of Jardins neighborhood, within walking distance from several high-end shops and renowned restaurants and bars and just 2,950 feet from Paulista Avenue and 1,150 feet from Oscar Freire Subway Station, Quality Suites Oscar Freire offers an outdoor swimming pool, a sauna and a fitness center. Free WiFi is available throughout the property and private parking is possible on site. The recently renovated rooms at Quality Suites offer air conditioning,a safety deposit box, a work desk, an LCD TV with cable channels and a mini-bar. The private bathroom includes a shower and a hairdryer. 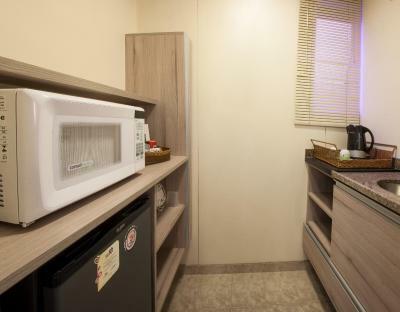 Some rooms also feature a balcony and a kitchenette fitted with a microwave and utensils. Guests can enjoy French Cuisine and international dishes at the on-site Marcel Restaurant or have a drink at the bar. Other facilities at Quality Suites Oscar Freire include a sauna, a solarium, meeting facilities and a 24-hour front desk. Guests will find various shopping and dining options just 500 feet from the hotel, such as the recently opened Calvin Klein Flagship, Carlo's Bakery and Mori Restaurant. A Figueira Rubaiyat is 1,800 feet way, while Dalva e Dito Restaurant is 2,300 feet from Quality Suites. Pacaembu Stadium and Rebouças Convention Center can be reached in less than 1.2 mi, while Ibirapuera Park is 1.9 mi away. Both Eldorado and Iguatemi Shopping Mall are 1.9 mi from the hotel, while Congonhas Airport is 5.9 mi away. When would you like to stay at Quality Suites Oscar Freire? This recently renovated room is located between the 7th and the 15th floor and features air conditioning, a 32" LCD TV with cable channels and free WiFi. It comes with a work desk, a safe box and a telephone. The open plan kitchen features a mini bar. Bathroom is fitted with a hair dryer and amenities from Natura. Private parking is available on site (reservation is needed) and costs BRL 25 per day. This recently renovated room features air conditioning, a 32" LCD TV with cable channel and free WiFi. It comes with a work desk, a safe box, a kettle and a telephone. The open plan kitchen features a microwave and a mini bar. Bathroom is fitted with a hair dryer and amenities from Natura. Please note that this room category is located between the 4th and the 6th floor. This recently renovated air conditioned room features a 42" LCD TV with cable channel and free WiFi. It comes with a work desk, a safe box and a telephone. The open plan kitchen features a mini bar. The private bathroom is fitted with a hair dryer and amenities from Natura. Please note that rooms of this category are located within the 16th and 19th floors. This recently renovated air-conditioned room features free WiFi. It comes with a work desk, a safe box and a mini-bar. The private bathroom includes a shower and a hairdryer. This recently renovated air-conditioned room features free WiFi, a flat-screen TV with cable channels, a work desk, a safety box deposit and a mini-bar. The private bathroom includes a shower and a hairdryer. House Rules Quality Suites Oscar Freire takes special requests – add in the next step! Quality Suites Oscar Freire accepts these cards and reserves the right to temporarily hold an amount prior to arrival. Please note that a security deposit may be authorized on the guest's credit card in case of expenses not included in the rate. Please contact the property for further details. I booked for someone else taking a business trip. I had issues with the payment and the staff. We were double charged some of the expenses and I am still trying to get reimburse for these. The cleanness of the room, it was a bit dusty on the floor, next to the bed, inside of the wardrobe and on top of the table. I came back TIRED of a full day working - at 5:45 pm - wanting to take a shower and a nap before the event I did have to attend later that night , but my room was unmade. Nobody showed up to make up my room and change my towels. I had to call reception and get upset, and wait 20 minutes for the cleanup lady to show up. Then, I realised that the people from the fridge disnt replace my waters as well. I had to call reception but they got inside my room while I was taking a shower to do the replacements. Totally unprofessional. I arrived at 17:30 in the afternoon and my room was not ready. Bed unmaid, towels on the floor. Had to wait 15 minutes until somebody showed up. Then later I realised that not even water was refilled on the fridge. Totally unnecessary, lost a client. And nobody cared. This serms to be normal to them. I lost 45 min of my time to rest a little before my dinner out. No kettle or tea/coffee. Not interested in the reception staff saying this was not included in the "class" of accommodation. What non-sense is this! It's just tea and coffee for god's sack!!! The charge for using the business center was too high - get real here! The fitness and leisure area are in need of a lift. Breakfast is very average. The air conditioning is central (which means it’s either on or off and cannot be adjusted). The location is excellent and the staff are extremely friendly. 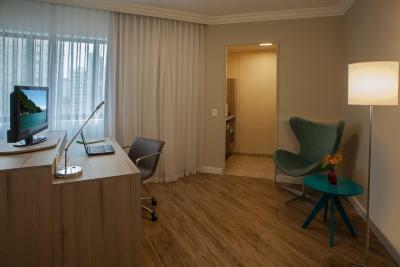 The rooms are new and the food in the restaurant (dinner) is very good and decently priced for São Paulo standards. Breakfast could be more varied and often gets crowded. Gym and pool area are very average. Location is perfect and staff are extremely friendly and helpful. the bathrooms could be a bit bigger. But we love the location. Some construction work going on early in the morning on the upper floor which we could hear in our bedroom which woke us up.